Vascular endothelial growth factor (VEGF) is an important mediator in maintaining normal kidney functions. In addition, several lines of evidence suggest that upregulation of VEGF in glomeruli may be associated with or cause renal dysfunction such as diabetic nephropathy. 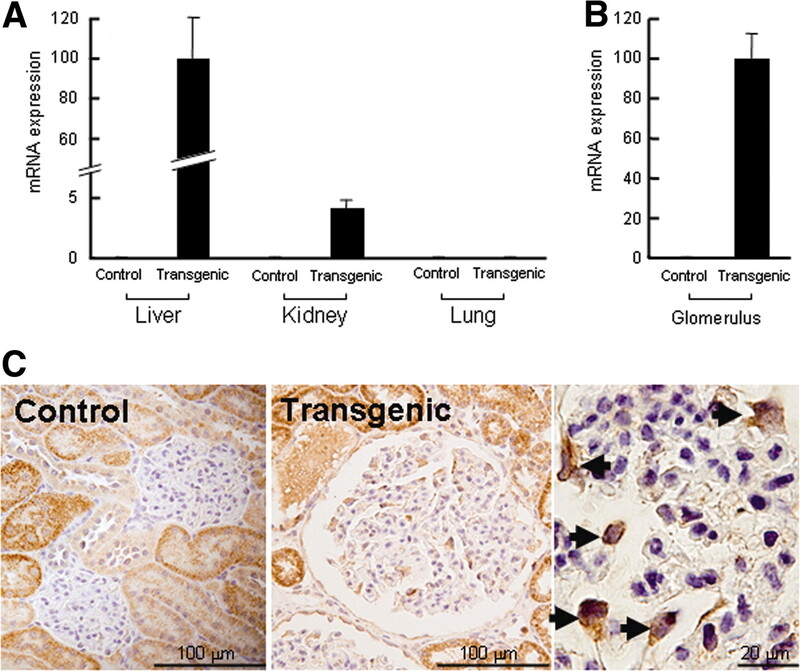 For elucidation of the pathologic consequences of high levels of VEGF in glomeruli, transgenic (Tg) rabbits that express human VEGF165 isoform in both kidney and liver under the control of the human α-1-antitrypsin promoter were generated and characterized. With the use of heterozygous Tg rabbits and their littermates aged 8 to 55 wk, renal functions and structures were investigated. Compared with control rabbits, Tg rabbits exhibited progressive proteinuria with increased GFR at the early stage and decreased GFR at the later stage. Histologic examinations revealed that Tg rabbit kidneys were characterized by considerable glomerular hypertrophy as a result of increased proliferation of both glomerular capillaries and mesangial cells accompanied by prominent podocyte hypertrophy. With increasing age starting from 20 wk, Tg rabbit kidneys showed prominent formation of microaneurysms and capillary proliferation at the vascular pole area. At a later stage (55 wk), many glomeruli showed sclerosis and tuft collapse with the formation of glomerular cysts on a background of tubular atrophy and interstitial fibrosis. This study provides the first evidence that increased expression of VEGF in glomeruli directly causes the glomerular hypertrophy that is associated with proteinuria, suggesting that VEGF exerts multiple effects on the glomerular pathophysiologic processes. Vascular endothelial growth factor (VEGF) is an important regulator of angiogenesis. VEGF stimulates endothelial cell proliferation and differentiation, increases vascular permeability, mediates endothelium-dependent vasodilation, and supports vascular survival by preventing endothelial apoptosis. In general, VEGF exerts its physiologic functions via binding to specific cellular surface receptors, VEGFR-1 through -3 and neuropilin 1 to 2 (see review by Ferrara1). In the kidney, VEGF and its receptors are widely expressed in different types of cells. VEGF mRNA is expressed most prominently in glomerular podocytes, distal tubules, and collecting ducts and to a lesser extent in some proximal tubules,2,3 whereas VEGF receptors are mainly expressed by endothelial cells of glomerular and peritubular capillaries.4 VEGF exerts a number of physiologic and pathophysiologic effects on the kidneys. It is widely known that VEGF is essential for normal nephrogenesis, particularly glomerulogenesis,5 and homozygous deletion of VEGF genes in glomeruli resulted in perinatal lethality of knockout mice.6 Ample data suggest that increased VEGF may be involved in the pathogenesis of glomerulopathies such as diabetic nephropathy and FSGS.3 VEGF and its receptors are upregulated in the diabetic states of experimental animals.7,8 Eremina et al.6 showed that podocyte-specific overexpression of the VEGF164 isoform in mice resulted in renal failure as a result of a collapsing glomerulopathy. Several reports showed that there may be a close relationship between plasma levels of VEGF and proteinuria.9 The data collected thus far suggest that constitutive expression of VEGF in the glomerular epithelial cells essentially maintains normal glomerular functions and provides a filtration barrier, whereas aberrant increased expression of VEGF may potentially be detrimental in terms of renal functions, although this hypothesis has not been verified. Although previous studies so far have established a link between increased VEGF and glomerular injury and proteinuria, it remains unknown whether increased VEGF is causative of or simply a consequence of these pathologic processes. In fact, there is still controversy regarding the beneficial and deleterious effects of VEGF on the kidney because some studies even suggested that VEGF may protect against renal injury.10 However, the precise elucidation of the direct pathophysiologic effects of VEGF in the previous studies may have been complicated by the presence of other factors, such as advanced glycation end products, plasminogen, and high levels of plasma glucose. It is also not clear whether glomerular VEGF can directly affect the filtration of the glomerulus or plays a central role in the pathogenesis of glomerulopathies and proteinuria. One of the valid and powerful methods to answer this “cause-and-effect” question may rely on the application of transgenic (Tg) animal models in which VEGF is overexpressed in glomeruli while excluding other interfering factors such as high levels of blood glucose. To achieve this goal, our laboratory generated Tg rabbits to study the relationship between VEGF and glomerulopathies. The rabbit was selected for this undertaking because of its usefulness in the study of vascular biology and because the large size of rabbits compared with rodents may also facilitate many biochemical analyses of the plasma and surgical intervention.11 In this study, we characterized VEGF Tg rabbits and found that overexpression of VEGF in the glomerular cells has profound effects on the kidney pathologies. Analysis using real-time reverse transcriptase–PCR revealed that the renal expression of human VEGF (hVEGF) was 4.5% (arbitrary units) of the hepatic expression (Figure 1A) and the total VEGF mRNA expression (sum of human transgene and rabbit endogenous gene) in the whole kidneys of Tg rabbits was slightly increased compared with that of control rabbits (19% increase over the control kidneys on average, arbitrary units). To determine whether hVEGF was expressed in glomeruli, we isolated glomeruli from tubules by a sieving method and found that the expression of hVEGF indeed occurred in the glomeruli of Tg rabbits (Figure 1B). Tg rabbit glomeruli were hypertrophic compared with control glomeruli (Figures 3 and 4). Immunohistochemical staining showed that the hypertrophic podocytes in the hypertrophic glomeruli of Tg rabbits exhibited discernible VEGF staining, whereas the tubules of both Tg and control rabbits expressed VEGF (Figure 1C). Detection of human vascular endothelial growth factor (hVEGF) expression in transgenic (Tg) rabbit (at 20 wk) kidney and liver (A) and glomeruli (B) by real-time reverse transcriptase–PCR as described in the Materials and Methods section. (C) Paraffin sections were immunohistochemically stained with hVEGF antibody. Compared with the controls (left), Tg rabbit glomeruli were larger in size (middle). VEGF staining was clearly present in hypertrophic podocytes of Tg rabbits (right). Arrowheads are VEGF-positive podocytes of Tg rabbits. To determine whether a certain amount of hVEGF may be present in the circulation of Tg rabbits, we measured the plasma VEGF using two different ELISA with human VEGF as a positive control. As shown in Table 1, Biotrak ELISA kits revealed that the plasma levels of VEGF were 1.2-fold higher in Tg rabbits than that in control rabbits, although not statistically significant (P = 0.272). CytELISA (hVEGF specific) kits along with Western blotting analysis (data not shown), however, did not detect the presence of human VEGF in the plasma of Tg rabbits. These data suggest that the transgenic hVEGF proteins were indeed expressed locally or associated with extracellular matrix (ECM), and little, if any, were released into the circulation. Compared with control rabbits, Tg rabbits had slightly lower body weight with relatively enlarged kidneys (Table 2). To evaluate the effects of increased expression of VEGF on renal functions, we first examined whether Tg rabbits exhibited proteinuria. Proteinuria was not detected in Tg rabbits until 12 wk and gradually became prominent thereafter with increasing age and reached a plateau at 28 wk (Figure 2A). To quantify the contents of urinary proteins, we analyzed the 24-h urinary proteins that were collected from rabbits at various ages when proteinuria was markedly increased. As shown in Table 3, the levels of urinary proteins in Tg rabbits were 12.7-, 34-, and 33-fold higher than those in control rabbits at 23, 28, and 42 wk. SDS-PAGE analysis demonstrated that the major urinary protein was albumin on the basis of its molecular size of approximately 68 kD (Figure 2A, insert). In addition, GFR of Tg rabbits at 23 wk was increased by 10% but progressively declined by 45 and 35% at 30 and 42 wk, respectively, compared with that in control rabbits (Figure 2B), suggesting that upregulation of VEGF impairs the glomerular barrier functions of Tg rabbits. Biochemical analysis of the plasma showed that Tg rabbits had hyperlipidemia and lower level of albumin at 30 wk, whereas their glucose, blood urea nitrogen, creatinine, and total proteins were not significantly different from control rabbits (Table 4). To exclude the possibility that hepatic dysfunctions of Tg rabbits may be responsible for lower albumin levels in plasma, we measured the plasma glutamic-oxaloacetic transaminase (GOT) and glutamic pyruvic transaminase (GPT) and found that there was no significant difference between control and Tg rabbits at 30 wk (GPT 32.2 ± 10.9 IU/L in control versus 44.3 ± 15.9 IU/L in Tg; GOT 40.5 ± 9.1 IU/L in control versus 46 ± 13.3 IU/L in Tg). Measurements of urinary proteins (A) and GFR (B). Urinary protein levels were determined in rabbits at various ages as described in the Concise Methods section. Urine samples were also analyzed using SDS-PAGE (A, insert). GFR was measured at the ages of 23, 30, and 42 wk and expressed as percentage of the control. Data are means ± SEM; n = approximately 5 to 6 rabbits for each group. *P < 0.05, **P < 0.01 versus control. Because Tg rabbits exhibited apparent renal dysfunction as described above, we next examined the pathologic changes of the kidneys of Tg rabbits at various ages. For the convenience of descriptions of glomerular changes, we arbitrarily divided the renal lesions of Tg rabbits into (1) early stage (preproteinuria stage, before 8 wk), (2) intermediate stage (12, 20, and 35 wk), and (3) later stage (55 wk) according to the appearance and extent of proteinuria and severity of renal pathology. 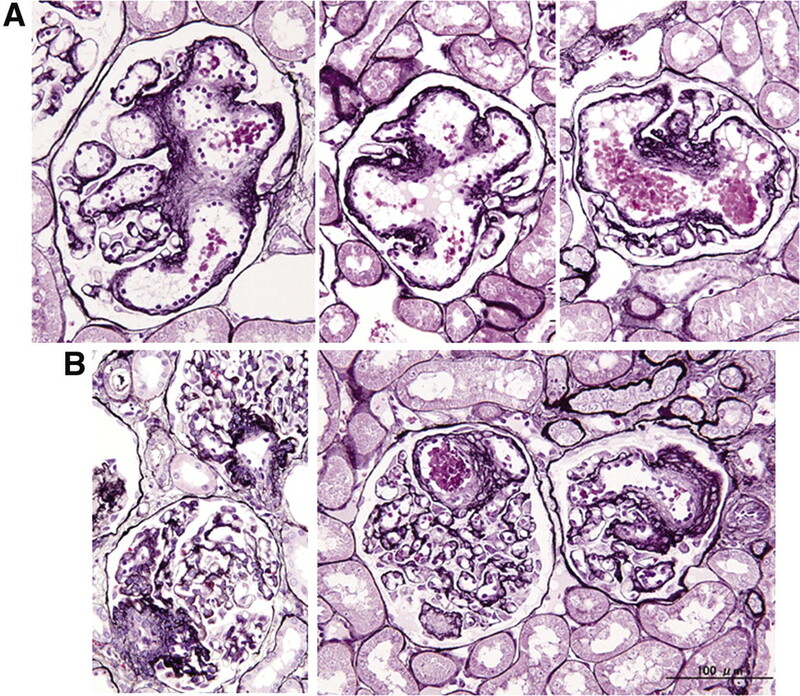 At first glance, the renal histologic morphology of Tg rabbits starting from 8 to 20 wk was characterized by progressive glomerular hypertrophy with increased cell numbers per glomerulus (Figure 3). The glomerular size in Tg rabbits was increased by 1.17-, 1.76-, and 2.4-fold at 8, 12, and 20 wk compared with that in control rabbits (Figure 4A). The glomerular hypertrophy in Tg rabbits was caused by an increase of the number of cells, including both endothelial cells and mesangial cells on the basis of the morphologic features and immunohistochemical staining with CD31 mAb (Figures 4, B through D, and 5). Micrographs of glomeruli of control and Tg rabbits at 12 wk. Paraffin sections from rabbits were stained with either periodic acid-Schiff (PAS; top) or periodic acid-methenamine silver (PAM; bottom). Compared with the controls, the glomeruli of Tg rabbits showed increased proliferation of endothelial cells and mesangial cells and increased mesangial matrix contents. Morphometric analysis of glomerular area and cell number. PAM-stained sections were examined for glomerular area (×103/μm2) and total cell number per glomerulus (A and B). The number of endothelial cells and mesangial cells were further calculated on the basis of the morphology on PAS-stained sections (C and D). PAM-stained area was measured and expressed as mesangial matrix content (%; E). Data are means ± SEM; n = approximately 5 to 6 rabbits for each group. *P < 0.05, **P < 0.01 versus control. Immunohistochemical staining using CD31 mAb. Rabbits at 35 wk were used. Compared with normal glomerulus (left), Tg glomerular CD31-positive endothelial cells are increased in number (middle and right). It should be noted that in the early stage, even though proteinuria was still not detected, the number of endothelial cells in Tg glomeruli was significantly increased. In the intermediate stage, proteinuria started to became obvious starting from 12 wk; however, mesangial cells along with endothelial cells were concomitantly increased in Tg rabbits compared with those of control rabbits (Figure 4, C and D). Furthermore, the mesangial matrix contents were significantly increased at 20 wk in Tg rabbits compared with the controls (Figures 3 and 4E). Another important histologic feature of the glomeruli of Tg rabbits was the appearance of pronounced hypertrophy of podocytes (Figure 6A), whereas the number of podocytes (Wilms’ tumor-1 [WT-1]-positive cells) per glomerulus was slightly increased (average podocyte number per glomerulus 7.7 ± 1.8 in control versus 9.6 ± 3.0 in Tg at 20 wk; P < 0.001; Figure 6B). Hypertrophic podocytes were larger in size than those of the controls (three-fold increase on average; P < 0001) and were characterized by a prominent large single nucleus or occasionally two nuclei (Figure 6A; see also transmission electron microscopy [TEM] results). Demonstration of podocytes in the glomerulus. The podocytes of Tg rabbits are increased in size and contained one or two large nuclei, shown by PAM staining (A). Arrowheads are podocytes of control and Tg rabbits. The podocytes can be stained by mAb against Wilms’ tumor 1 (WT-1) as shown in B.
TEM examinations (Figure 7A) confirmed that podocyte hypertrophy was the major feature of Tg glomeruli, as shown by light microscopy. In addition, compared with normal rabbit podocytes, Tg rabbit podocytes showed loss of slit pores, and their foot processes appeared fused together and effaced (Figure 7B), which may be the major structural abnormalities responsible for proteinuria in Tg rabbits. 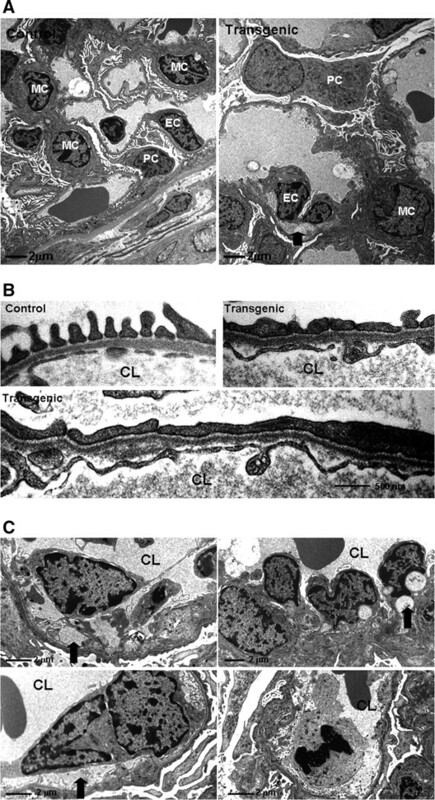 Whereas mesangial cells appear large under TEM, endothelial cells exhibited several abnormal alterations that were not present in normal rabbit. Endothelial cells were often loosely attached on the ECM as a result of subendothelial edema, and some showed apoptotic changes (Figure 7, A and C). Transmission electron microscopic observation of glomerular cells. (A) Representative pictures of glomerular cells from control and Tg rabbits at 25 wk. Compared with control rabbit glomeruli (left), capillary loops of Tg rabbit are dilated and endothelial cells (EC) show subendothelial edema (arrow, right). Podocytes (PC) of Tg rabbits are clearly large in size, and their foot processes are not clear compared with that of control rabbits. Mesangial cells (MC) are also large in Tg rabbits. (B) Compared with the control glomerulus in which podocyte foot processes are arranged regularly perpendicular to the capillary loop (CL) basement membrane (top left), Tg podocyte foot processes appear irregular or fused together (top right) or effaced along the surface of the capillary basement membrane (bottom). (C) Endothelial cells of Tg glomerulus show marked subendothelial edema (left, arrows), subendothelial vacuolization (top right, arrow), and apoptotic changes (bottom right). From 20 wk, the proliferation of endothelial cells and mesangial cells reached the peak value of the experimental periods (Figure 4, C and D), and the hypertrophic glomeruli of Tg rabbits were uniformly characterized by two remarkable pathologic findings: The formation of so-called microaneurysms12 and marked endothelial cell proliferation in the vascular pole area (Figure 8). Microaneurysms were formed by the dilated capillaries and were considered to be caused by mesangiolysis.12 They were either in a multiple “glandular” or in a lobular pattern or combined into a large dilated vessel (Figure 8A). In the vascular pole area, endothelial cells proliferated and aggregated or formed a vascular channel (Figure 8B). The proliferation index (5-bromo-2-deoxyuridine [BrdU] incorporation) of glomerular cells was significantly higher in Tg rabbits than that in control rabbits (3.1 ± 0.4% in Tg versus 0.9 ± 0.3% in control rabbits; P < 0.01; Figure 9). Representative micrographs of glomeruli from Tg rabbits at 35 wk. Paraffin sections were stained with PAM, and glomeruli with the formation of microaneurysms (A) or endothelial cell proliferation in the vascular pole area (B) were seen. Representative pictures showing the proliferating cells in glomerulus. 5-Bromo-2-deoxyuridine (BrdU)-positive cells were stained as described in the Concise Methods section. Tg rabbit (at 39 wk) glomerulus contains more BrdU-positive cells than does control glomerulus. In the later stage (55 wk), most glomeruli in Tg rabbits showed more severe and more complicated lesions, including evidence of the healing process, after glomerular injury. In addition to the lesions (proliferation of capillary and mesangial cells and microaneurysms) described, the majority of glomeruli showed either global or segmental sclerosis or tuft collapse (partially or completely) or glomerular cysts (Figure 10, A and B). In sclerotic glomeruli, some cells around the Bowman's capsule were positively stained with mAb against α-smooth muscle actin (Figure 10, C through E). Apart from the lesions seen in glomeruli, tubular atrophy accompanied by interstitial fibrosis was frequently found throughout in Tg rabbit kidneys (data not shown). There was no macrophage infiltration in the glomeruli of either Tg or control rabbits, as confirmed by immunohistochemical staining (data not shown). Representative micrographs of glomeruli from Tg rabbits at 55 wk. Paraffin sections were stained with PAS (A), PAM (B and C), Azan (D), and α-smooth muscle actin (E). (A) Glomeruli showed either global or partial tuft collapse accompanied by cystic formation. (B) At higher magnification, glomeruli showed obvious tuft collapse with sclerosis and Bowman's capsule fibrosis. A glomerulus with severe global sclerosis is shown (C through E), and increased fibrosis (D) and α-smooth muscle actin–positive cells were present (E). In this study, we characterized Tg rabbits that expressed the hVEGF165 isoform in the kidney in an attempt to evaluate the effect of increased VEGF on kidney pathophysiology. Human VEGF transgene expression was under the control of α-1-antitrypsin promoter, so the transgene was mainly expressed in the liver and, to a lesser extent, in the kidney.13 Although this promoter is not kidney specific, we found that Tg rabbits showed a mild increase of VEGF expression in the glomeruli (approximately 19% increase of mRNA expression over that in control rabbit kidneys). hVEGF proteins were not detected in the plasma of Tg rabbits by ELISA and Western blotting. This result was initially surprising but may suggest that either hVEGF was associated with plasma inhibitors or the levels of plasma hVEGF were too low to be detected or hVEGF may be bound to the ECM. Despite this, our studies suggest that increased VEGF expression in kidney and liver has dramatic and multiple biologic effects on both glomerular cells and ECM production. Compared with control rabbit glomeruli, the glomeruli of Tg rabbits were markedly hypertrophic, and the hypertrophy was associated with increased capillaries and mesangial cell proliferation. It is unlikely that these lesions were mediated by immune dysfunctions, because IgG staining was negative (data not shown). It seems that increased VEGF expression initially induces proliferation of endothelial cells and later induces that of mesangial cells, even though both types of cells express VEGF receptors.4,14 In this respect, Ostendorf et al.15 showed that administration of VEGF165 antagonist led to a reduction of glomerular endothelial cell proliferation and an increase in endothelial cell death in nephritis, whereas proteinuria was not improved. Of note, podocytes were markedly hypertrophic (up to three-fold increase in size over the control) in Tg rabbits, accompanied by the loss of podocyte processes as observed by TEM. The mechanism by which VEGF induces podocyte hypertrophy is unknown but may possibly be mediated in an autocrine manner because podocytes not only produce VEGF but also express VEGF receptors.16,17 Although this hypothesis remains to be verified, podocytes may have the potential to bind to the VEGF that they secrete themselves. Consistent with the previous finding that VEGF can also stimulate podocytes to proliferate and increase their survival in vitro,18 we found that hypertrophic podocytes in Tg rabbits were increased in number and had two or more nuclei, suggesting that VEGF may enhance podocyte growth in vivo. The pathologic changes that were observed in Tg rabbits at later stages were also interesting. For example, glomerular sclerosis as defined by the periodic acid-methenamine silver (PAM)-stained area was markedly increased with age and accompanied by severe proteinuria. 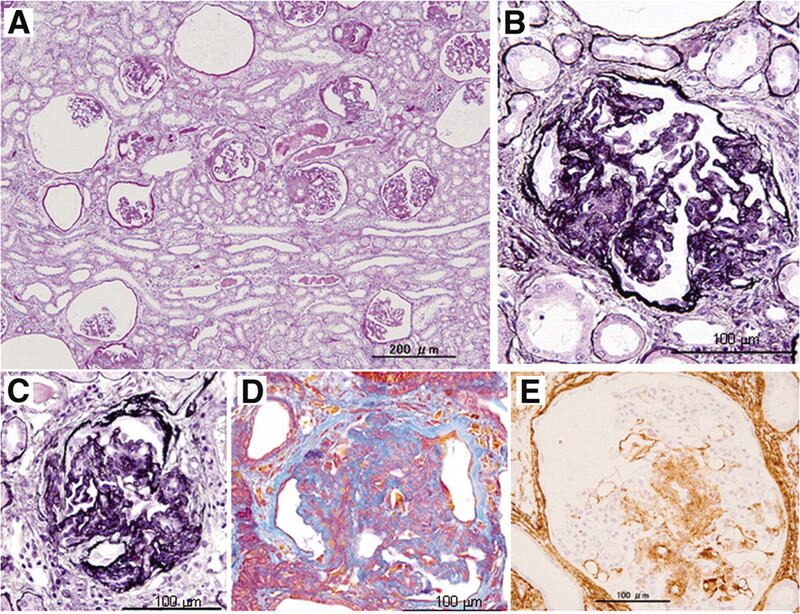 Such features of Tg rabbit glomeruli may mimic many pathologic characteristics of renal diseases, such as FSGS in humans,19 suggesting that the upregulation of VEGF may be a potentially causative factor for the progression of FSGS. Two mechanisms may be operative in terms of VEGF-induced glomerulosclerosis. First, it has been reported that glomerular hypertrophy can directly cause segmental glomerulosclerosis via podocyte damage.20,21 Second, VEGF derived from podocytes may stimulate mesangial cells to proliferate and synthesize ECM.22 In support of this speculation, both mesangial cells and ECM were markedly increased in the glomeruli of Tg rabbits after 20 wk. Of note, massive formation of glomerular microaneurysms was another feature of the Tg rabbits after 20 wk. Glomerular microaneurysms can be induced in experimental mesangioproliferative anti–Thy-1 nephritis.12 Although the pathologic significance of such lesions is unknown, mesangial cell damage (mesangiolysis) is proposed to be responsible for the formation of microaneurysms. If this is really operative, it remains to be determined whether VEGF either directly or indirectly induces mesangiolysis in future. Podocytes play an important role in maintaining the glomerular filtration barrier because podocytes contribute structurally by the provision of the slit diaphragm and glomerular basement membrane.23 Glomerular VEGF derived from podocytes is also involved in the maintenance of the glomerular endothelium (including maintaining fenestration) and/or selective permeability to macromolecules.15,23 Therefore, it is reasonable to speculate that hypertrophic podocytes that are observed in Tg rabbits may lose their normal physiologic function of maintaining the macromolecular selectivity of the glomerular filtration barrier as one of the mechanisms that are responsible for the prominent proteinuria that is observed in Tg rabbits. In Tg rabbits, the proteinuria started to become obvious from 12 wk, suggesting that the deleterious effect of VEGF was progressive and required a certain time rather than starting from embryogenesis. Previous reports have shown that increased plasma levels of VEGF may be associated with proteinuria in patients with diabetes,9 and the administration of VEGF antibodies ameliorates proteinuria in diabetic nephropathy.24,25 Our results are in support of the notion that VEGF is an important mediator of glomerular functions and that the chronic upregulation of VEGF in podocytes leads to prominent and progressive proteinuria. Increased VEGF in the glomeruli may result in proteinuria through two possible different yet closely overlapping or related mechanisms. In the early stage, in addition to the abnormalities of hypertrophic podocytes discussed, high levels of VEGF derived from podocytes can strongly bind to capillary endothelial cells through specific VEGF receptors, which may result in increased permeability or glomerular hyperfiltration by altering capillary fenestration or basement membrane components26 or indirectly through the induction of nitric oxide and prostacyclin.27 In our study, we found that many endothelial cells in glomeruli showed subendothelial edema (Figure 7C). It has been reported that VEGF stimulates increased synthesis of collagenase by endothelial cells, which would result in the proteolytic disruption of the basement membrane.22 In the later stage, however, there were severe secondary glomerular injuries, including microaneurysms, tuft collapse, and glomerular sclerosis along with tubular injuries, all of which may participate in the enhancement of proteinuria. Therefore, the mechanisms that are responsible for proteinuria in Tg rabbits may be different in the early stage (mainly primary effect directly mediated by VEGF) from those in the later stage (both VEGF-induced effects and/or secondary effects on glomerular injury). Consistent with this notion, our study showed that in Tg rabbits, there was a increase of GFR at 23 wk, but later on, GFR was progressively decreased, possibly reflecting the severe glomerulosclerosis. Our study demonstrated that local overexpression of the hVEGF165 gene in the podocytes of Tg rabbits resulted in glomerular hypertrophy and increased proliferation of both endothelial cells and mesangial cells and glomerular sclerosis associated with progressive proteinuria. Podocytes were markedly hypertrophic and showed effacement of their foot processes. These data support the hypothesis that VEGF is involved in the maintenance of the glomerular barrier and in the pathogenesis of proteinuria. It is interesting that Tg rabbits exhibited many pathologic features similar to those found in human FSGS. These results suggest that local upregulation of VEGF may play diverse roles in glomerulopathies and proteinuria. Inhibition of VEGF in the glomeruli may become a potential target for the treatment of kidney diseases such as diabetic nephropathies and FSGS. Tg rabbits that express hVEGF165 cDNA under the control of the human α-1-antitrypsin promoter31 were generated in our laboratory.32 A previous study showed that the α-1-antitrypsin promoter contained an element that was able to direct the expression of the transgene in the kidney in addition to the liver.13 Three founders were obtained, but one founder died before breeding. Autopsy examination revealed that this founder had hepatic and kidney lesions. The blood levels of hVEGF of all three founders were below the detection). For this study, heterozygous male Tg rabbits and control littermates from V58 line were analyzed at the ages of 8 to 55 wk. All rabbits were kept individually in a room where the temperature and humidity were maintained at 24 ± 2°C and 55 ± 15%, respectively. The rabbits were submitted to a regular 12-h light/dark cycle and given water and a standard chow diet (CBR-1; CLEA, Tokyo, Japan) ad libitum. All experimental protocols were approved by the Saga University Animal Experimentation Committee and performed under the Saga University Guidelines for Animal Experimentation. For monitoring the health status of Tg rabbits, blood was collected from rabbits after overnight fasting (16 h), and the plasma albumin, blood urea nitrogen, creatinine, glucose, total protein, GOT, and GPT were determined using a compact VetScan unit (Abaxia, Union City, CA) in a Point-of-care blood analyzer (Abaxia, Sunnyvale, CA). Total RNA from different tissues was rapidly isolated using Trizol reagent (Invitrogen, Tokyo, Japan) and reverse-transcribed into cDNA using Qiagen reverse transcription reagents (Tokyo, Japan), and real-time reverse transcriptase–PCR (DNA Engine Opticon; MJ Research, Tokyo, Japan) was performed using DyNAmo SYBR Green qPCR kits (Finnzymes, Espoo, Finland) according to the manufacturer's instructions.33 We measured the human-specific VEGF and rabbit endogenous VEGF using specific primers as shown in Table 5. In addition, we separated glomeruli from tubules using a sieving method34 to examine the hVEGF mRNA expression in glomeruli. Urine was collected in the morning and examined for urobilinogen, blood, bilirubin, ketones, glucose, protein, pH, leukocytes, specific gravity, and ascorbic acid using Protest 10II strips (Wako Pure Chemical Industries, Osaka, Japan). The total amounts of urinary proteins excreted during 24 h were measured from rabbits at 23, 28, and 42 wk using protein assay kits (Bio-Rad Laboratories, Hercules, CA). In addition, urinary proteins were fractionated by 10% SDS-PAGE. For the morphologic analysis of kidneys, Tg and littermate control rabbits were killed at various ages and the kidneys were removed and fixed in a 10% neutral buffered formalin solution. The middle part of the left and right kidneys was embedded in paraffin, and serial sections were stained with hematoxylin and eosin, periodic acid-Schiff, Azan, and PAM, which were used for morphometric analysis (see next section). In addition, paraffin sections were immunohistochemically stained using mAb against rabbit macrophages (RAM11; 1:200; Dako, Carpinteria, CA); α-smooth muscle actin (1:400; Dako), and hVEGF (ab3; 1:100; Neomarkers, Fremont, CA), which showed cross-reaction with rabbit VEGF. In addition, we performed immunohistochemical staining using two cellular markers for human kidney, including endothelial cell markers CD31 and podocyte markers WT-1.38 We found that two CD31 and WT-1 could cross-react with rabbit kidneys. Immunohistochemistry was performed with the Dako En-vision system following the manufacturer's instructions. For the quantitative analysis of glomerular changes including glomerular size, cellular number, matrix expansion, or fibrosis, PAM-stained sections were examined under a light microscope and 40 constitutive images for each section were recorded using an Olympus DP70 digital camera (Tokyo, Japan). Glomerular size and mesangial matrix area were manually traced and measured using the Lumina Vision image analysis system (Mitani, Tokyo, Japan). Mesangial matrix area was defined as the PAM-stained area (%) within the tuft area as described by Inada et al.39 We calculated the cellular numbers using periodic acid-Schiff–stained sections on the basis of the cellular morphology and structure under light microscopy. All analyses were performed by two independent researchers blindly. For each assay, at least 40 consecutive intact glomeruli from each section were evaluated. To evaluate whether hypercellularity in the glomeruli of Tg rabbits was caused by increased proliferation, we examined the proliferating cells using the thymidine analogue BrdU labeling technique.40 The proliferation index of glomeruli of Tg rabbits was compared with that of control rabbits at 40 wk. BrdU (50 mg/kg) was subcutaneously injected at 1, 8, 16, and 24 h before the removal of the kidney. BrdU-positive cells were reacted with a mouse mAb against BrdU (1:100; Dako, Copenhagen, Denmark), followed by goat anti-mouse IgG antibodies conjugated to peroxidase, and detected with diacylaminobentidine. The number of BrdU-positive nuclei were counted from approximately 50 to 60 consecutive glomeruli per rabbit in a blinded manner. The BrdU labeling index was expressed as BrdU incorporation or percentage of total glomerular cells. Results are expressed as means ± SEM. Statistical analyses were performed using either the t test when the F value was equal or Welch t test when the F value was not equal. P < 0.05 was considered statistically significant. This work was supported in part by grants-in-aid for scientific research from the Ministry of Education, Culture, Sports and Technology, Japan (19790226 and 19390099 to J.F. ); a research grant from AstraZeneca, the Takeda Science Foundation; Japan Heart Foundation; and the Naito Foundation for the Promotion of Science. We thank F. Muto, H. Ideguchi, and S. Nakahara for technical assistance.